I’ll admit it right from the start: I have a crush on Buddy Guy. I have for years. Besides his mad guitar skills—which have inspired so many musicians and fans for decades—I admire his background and how hard he’s worked to not only keep the blues alive and relevant, but I also admire his humility with regard to other musicians and mentors as he’s come up in the industry. Then there’s that smile…and his sense of humor, which is pretty apparent when you see him perform. Anyhow, I digress. Buddy has recently come out with his 28th studio album, Born to Play Guitar, which has been getting quite a bit of airplay on SiriusXM’s Bluesville. And at 79 years young he is touring in support of its release. I have been fortunate enough to see him perform at least six times at a variety of venues, from relatively modest theaters to the Memphis in May Music Festival and the Blues Music Awards. This past Monday night I was treated to another live performance at The Birchmere, in Alexandria, VA. Mr. Buddy Guy did not disappoint, and the Damn Right Blues Band was absolutely stellar as well. Buddy is the king of dynamics, where he gently plays and sings a few bars of soft, sweet notes. And then BAM! He kicks you in the face with an assault on the strings to make you sit up and take notice. The band is so tight and so tuned in on Buddy during the (mostly) improvised show. They were on it. The title track and the third one, “Back Up Mama,” have a lot of similarities musically. I like them both. It may sound corny, but I find their melodies comforting. “Wear You Out” is a gritty juke joint tune sung by ZZ Top’s Billy Gibbons. “Kiss Me Quick” is one of my favorite tracks. It’s a typical Chicago-style tune and accompanied by blues harp veteran Kim Wilson. “Smarter Than I Was” has a cool beat and I liked the back and forth conversation with his guitar. “Crying Out of One Eye” features Muscle Shoals Horns; I think Buddy has collaborated with them a couple of times prior to this album. “Come Back Muddy” is another favorite of mine—there is an acoustic version as well as an electric, and the lyrics convey how much the friendship meant to Buddy. Overall I noticed more than a few of the songs have a common thread of retrospect and reflection. 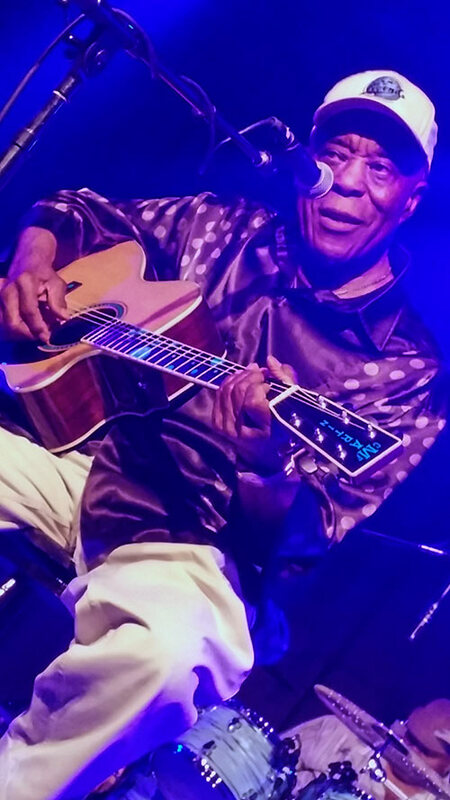 Case in point: “Born to Play Guitar,” “Crazy World,” “Thick Like Mississippi Mud,” “Flesh & Bone” (dedicated to BB King and a vocal duet with Van Morrison) and “Come Back Muddy.” It got me to thinking that the man has been performing for more than six decades. He’s had so many stories to tell, and he’s made an impact on blues, rock, pop…even funk. We arrived at the Birchmere before the doors opened, and picked up our guest passes. It was pretty cool to hang out with the band and talk about the tour, listen to sound check (I was loving the “Papa Was a Rolling Stone” jam) and then finally grab our seats front and center. The Damn Right Blues Band looked tired (they had played the night before…and the night before that…with a few more back-to-back shows coming up), but when show time hit, they were on. For two hours they played some of the new material as well as the old familiar ones and the show lasted about 30 minutes longer than expected. Buddy is a consummate performer…and is definitely a legend. And as for my crush “issue”…it was validated when Buddy leaned over and handed me a pick.